12 programmable macro buttons with 3 modes available making it 36 programmable options. Window key disabling switch can disable the ‘widows’ buttons along the bottom of the keyboard because seriously, who needs them when you’re gaming? Palm rest – tried it with and without, found the keyboard much more comfortable with the palm rest so it stayed. This switch disables the windows keys. We found this to be extremely handy when playing The Elder Scrolls IV ; Oblivion as this particular title doesn’t like it when you switch out of the game to the desktop. This feature isn’t unique to the G110 or G510 but it has been around since the older G11 and G15 boards and certainly a great feature to be retained. The USB port would not drive a portable hard drive like the WD passport drive which leads us to suspect that other devices needing more than basic amperage will find this port wanting. That said, front panel USB ports are basically standard now on almost all cases so it’s not a big deal. 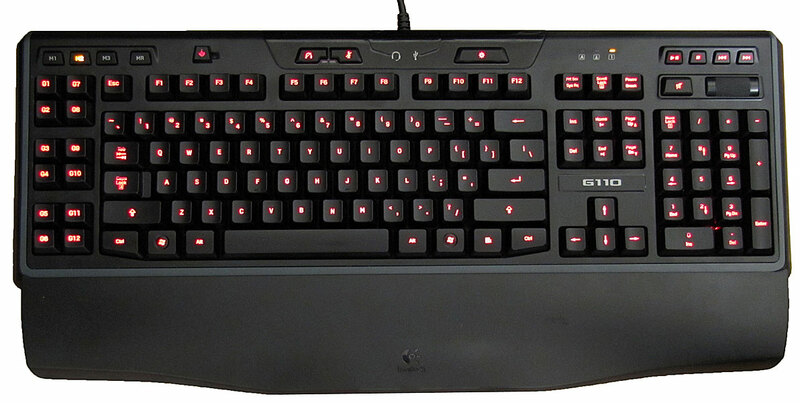 It was nice to have the G5 mouse piggy backing off the keyboard and this could be handy at a LAN event. Skype chat through the USB audio was clear and we couldn’t fault it. The in game audio of titles like BF BC2, Oblivion, Skyrim and BF3 were also on par with onboard sound in our opinion. The implementation of jack sensing technology here means that if you don’t have anything plugged in to these ports, then Windows will use the default sound devices so you won’t be diving in and out of your windows volume mixer every time you want to use the ports on the keyboard. To date, we haven’t noticed any limitations in gaming relating to ghosting or pressing multiple keys. I’d hoped that this would wear out so that I could justify buying the G510 but alas the trusty G110 has proven itself to be a very durable piece of kit. SB 2.0 device isn’t great for powered devices like passport drives or other USB devices that draw power. The backlight colours being red or blue and by combining them, various shades of purple. It would have been nice to see more options here (like green or white) but that would have added to the price. The cable management channels on the base of the keyboard may as well not be there. Your chance of buyers remorse are ‘low’ with this so we give it a Gold award for reliability, honesty and value. Previous articleOperation Metro: Good for One thing?